You can set up an opportunity for Reconciliation anytime by contacting one of our priests at 646-3556. Reconciliation is always avaiable for anyone needing to confess their sins, large or small. Everyone should make frequent use of the Sacrament of Reconcilation. First Reconciliation is celebrated by children in the second grade in preparation for First Eucharist, receiving the Body and Blood of Christ for the first time. 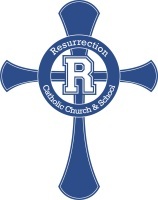 Catechetical preparation is given through our Religious Education Program and in the Resurrection Catholic School. How should I prepare my child for the Sacrament of Reconciliation? Catechesis for 1st Reconciliation is to precede 1st Communion and must be kept distinct from catechesis for 1st Communion. Reconciliation should normally be celebrated before 1st Communion for those Baptized as infants. Parents should be involved in the preparation of their children for this sacraments.Catechesis should stress the place of Reconciliation in the process of ongoing conversion and growth in holiness of the human person. The catechesis itself emphasizes God’s mercy and loving forgiveness. Catechesis should include an understanding of sin and its effect on person in relationship to other and God. Various forms of the sacrament should be explained while stressing that individual confession and absolution remains the ordinary way of reconciling the faithful with God and the Church. The historical development of the Sacrament should be covered. 1s Reconciliation on Wednesday December 4th! How should I prepare myself for Reconciliation? Wait at the chairs outside of the confessional until the priest is available. This is a good time to pray and do an Examination of Conscience. Walk into the confessional and sit down across from the priest or kneel at the kneeler. Pray the sign of the cross. The priest may offer some type of counsel, then gives you some penance to do. The priest absolves you of your sins. You will cross yourself as he mentions the Blessed Trinity. You can thank the priest for his time and exit the confessional. Reconciliation is avaiable at anytime and private confession is available every Saturday in the church, 2:45 to 3:45. Communal penance celebrations take place in all four Lakeland Churches during Advent and Lent.